Be among the first to experience the brand-new SpringHill Suites Houston Downtown/Convention Center. 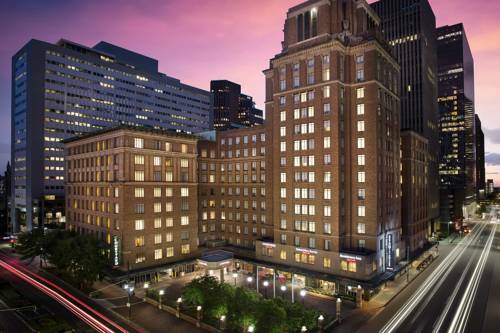 The most recent member of the Houston Downtown Marriott Center complex, our all-suite hotel sits in the historic Humble Oil building, just steps from George R. Brown Convention Center. Leave your ordinary travel routines behind as you step into a stylish blend of comfort and convenience while enjoying the modern amenities you need to stay refreshed and focused -- all at an affordable price. Start your day indulging at our complimentary hot breakfast buffet, then get yourself moving in our state-of-the-art fitness center. The sparkling outdoor pool is great to take advantage of when the temps are hot. When it's time to relax, let the stress of your day melt away as you make yourself at home in contemporary suites with luxurious bedding, free Wi-Fi and separate spaces to work and relax. Book our hotel suites in Downtown Houston for your next business trip or vacation and discover a breath of fresh air.